The Fujica Panorama G617 is a medium format roll film panorama camera introduced by Fuji in 1983. A couple of years later a renamed model called Fuji Panorama G617 was released in 1985. 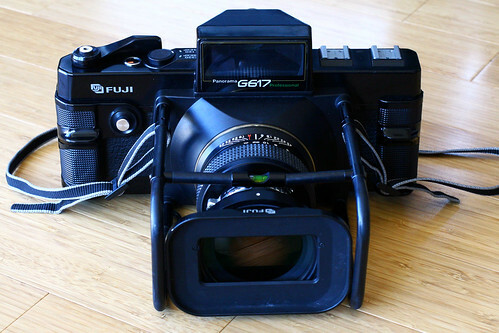 Its successor is the Fuji Panorama GX617 released in 1993. Photos are captured in a 6x17cm format onto 120 or 220 film. 120 film yields 4 exposure while 220 produces 8 exposures. The camera features a EBC Fujinon SW 105mm f/8 lens, with a 77mm filter thread. The shutter is the manually cocked type, it is located within the lens and made by Seiko. It has speeds from 1s to 1/500 of a sec. plus a bulb mode. The lens has a sync connector to attach to a flash. Electronic flash sync is available at all shutter speeds, M bulbs can be used for speeds of 1/30 of a sec. The film transport uses a four stroke film advance lever. There are two shutter releases on the camera. One on the front of the body while the other one is on top of the film advance lever. There are two accessory shoes, as well as a spirit level on top of the lens protector. The camera has strap connectors on either side of the lens protector. Depending on how the strap is attached, the camera can be carried either horizontally or vertically. Fuica Panorama G617 Pro instruction manual (English) from OrphanCameras.com website. This page was last edited on 2 July 2017, at 00:12.